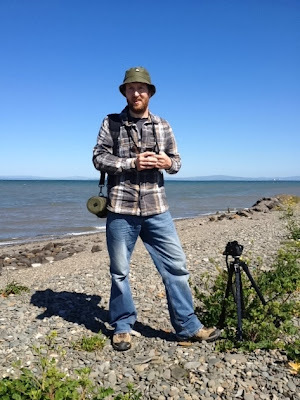 Now that things are up and running I thought it was maybe a good time to explain a little about myself and how I came up with the idea of Rare Bird Network. My name's Ade and as you've probably worked out by now I'm pretty into birding. Being brought up in a rural area, I'd always been interested in the wildlife around me, which led me to study for a BSc (hons) in Environmental Science. After graduating (and still not too sure about what I really wanted to do) I decided to volunteer for the RSPB at Leighton Moss in North Lancashire and the National Trust at Arnside & Silverdale AONB. So when I saw a National Trust job advert for Warden on the Farne Islands I knew that I had to apply. I was soon shipped out to live and work on the islands. Surrounded by breeding seabirds and seals, it was here where I was first properly introduced to "rares". I spent two years on the islands, becoming Head Warden of the outer group of islands in my second year. After making the difficult decision not to go back for a third year, I got a job with the Lincolnshire Wildlife Trust as Shorebird Warden at Gibraltar Point. I worked at "Gib" looking after the Little Tern colony and again having a good dose of east coast migrants for just over 12 months; before getting work as a Ranger up in Cumbria. I have regularly used social networking for work and it became very obvious that lots of other birders also do the same. As I'm sure you're aware Cumbria isn't particularly well blessed with rare migrants, so my holidays are often taken during spring and autumn where I visit the east or south coast. So before going away on holiday I'd trawl through Twitter and search out blogs to find out where to go and what I might see. Although all the information is out there, there seemed no co-ordinated approach to things. It was during a recent trip to Devon that the idea of Rare Bird Network came to me. Wouldn't it be great if every birder just added a pre-defined hashtag to their sightings on Twitter which would make it possible to see exactly what was going on in each county? This could be linked to a single site where you could easily gather bird sightings information for any county in the UK. That night I set up the @rbnUK Twitter account and Rare Bird Network was born.